Ototoxicity came to the forefront of clinical attention with the discovery of streptomycin in 1944. Streptomycin was used successfully in the treatment of tuberculosis; however, a substantial number of treated patients were found to develop irreversible cochlear and vestibular dysfunction. These findings, coupled with ototoxicity associated with later development of other aminoglycosides, led to a great deal of clinical and basic scientific research into the etiology and mechanisms of ototoxicity. Today, many well-known pharmacologic agents have been shown to have toxic effects to the cochleovestibular system. The list includes aminoglycosides and other antibiotics, platinum-based antineoplastic agents, salicylates, quinine, and loop diuretics. An image depicting inner ear anatomy can be seen below. Ototoxicity is typically associated with bilateral high-frequency sensorineural hearing loss and tinnitus. Hearing loss can be temporary but is usually irreversible with most agents. Generally, antibiotic-induced ototoxicity is bilaterally symmetrical, but it can be asymmetrical. The usual time of onset is often unpredictable, and marked hearing loss can occur even after a single dose. Additionally, hearing loss may not manifest until several weeks or months after completion of antibiotic or antineoplastic therapy. Vestibular injury is also a notable adverse effect of aminoglycoside antibiotics and may appear early on with positional nystagmus. If severe, vestibular toxicity can lead to dysequilibrium and oscillopsia. Permanent hearing loss or balance disorders caused by ototoxic drugs may have serious communication, educational, and social consequences. Therefore, the benefits of ototoxic drugs must be weighed against the potential risks, and alternative medications should be considered when appropriate. Management emphasis is on prevention, as most hearing loss is irreversible. No therapy is currently available to reverse ototoxic damage; however, basic scientists and clinicians are continually seeking to find new methods to minimize ototoxic injury while retaining the therapeutic efficacy of these agents. For severe hearing loss, amplification may be the only treatment option. Since their introduction in 1944, multiple aminoglycoside preparations have become available, including streptomycin, dihydrostreptomycin, kanamycin, gentamicin, neomycin, tobramycin, netilmicin, and amikacin. The aminoglycosides are bactericidal antibiotics that bind to the 30S ribosome and inhibit bacterial protein synthesis. They are active only against aerobic gram-negative bacilli and cocci. Although the ototoxic effects of aminoglycosides are well documented, this class of drugs is still widely used today. Aminoglycosides may be used in combination with penicillin in staphylococcal, streptococcal, and, especially, enterococcal endocarditis. An aminoglycoside is often added to a beta-lactam antibiotic when serious Pseudomonas aeruginosa infections are treated. Aminoglycosides can also be effective in the treatment of tuberculosis. Particular groups of patients, including those with cystic fibrosis, immune dysfunction, and certain chronic infectious disease, are more likely to be treated with this class of antibiotics. Of all ototoxic drugs, the aminoglycosides are the most vestibulotoxic, although they vary greatly in their differential effects on the vestibular and cochlear systems. Kanamycin, amikacin, neomycin, and dihydrostreptomycin are preferentially cochleotoxic. Gentamicin affects both cochlear and vestibular systems; however, most authors include gentamicin as primarily vestibulotoxic. Streptomycin, tobramycin, and netilmicin are also primarily vestibulotoxic. Aminoglycosides are cleared more slowly from inner ear fluids than from serum and therefore a latency exists to the ototoxic affects of aminoglycosides. This latency can result in progression of hearing loss or onset of hearing loss after cessation of aminoglycoside treatment. Continuing to monitor the patient for cochleotoxic and vestibulotoxic effects up to 6 months after cessation of aminoglycoside treatment is important. The exact mechanisms of aminoglycoside ototoxicity remain unknown. Many cellular processes have been implicated, and this continues to be an active area of research. It does appear that aminoglycoside agents must enter hair cells to induce cell death. After entry into hair cells, many cellular mechanisms and processes may be involved. Disruption of mitochondrial protein synthesis, formation of free oxygen radicals, activation of c-Jun N-terminal kinase (JNK), and activation of caspases and nucleases can ensue. Aminoglycosides have also been shown to have direct effects on cellular membrane potentials through interactions with potassium channels. In addition, aminoglycoside interaction with transition metals such as iron and copper potentiate the formation of free radicals and further cell damage. Aminoglycoside ototoxicity is likely multifactorial, and further investigation continues. Some studies are investigating iron chelators and antioxidants as possible agents to prevent hearing loss during therapy, while other studies are exploring forms of gene therapy as future treatment options. Currently, no treatment is available apart from amplification and cochlear implantation; therefore, prevention is paramount. In certain countries, antibiotics are prescribed freely or are available without prescription. In these areas, aminoglycosides cause as many as 66% of cases of deaf mutism. Depending on agent and dosing, up to 33% of adult patients may have audiometric changes with aminoglycoside treatment. Vestibular toxicity is also well documented; it occurs in as many as 4% of adult patients. The incidence of patients who experience toxicity due to aminoglycosides may be decreasing because of improvements in monitoring and heightened awareness. Certain factors may put patients at increased risk for ototoxicity. Aminoglycoside ototoxicity is more likely to occur with larger doses, higher blood levels, or longer duration of therapy. Other high-risk patients include elderly patients, those with renal insufficiency, those with preexisting hearing problems, those with a family history of ototoxicity, and those receiving loop diuretics or other ototoxic or nephrotoxic medications. Clinically, acute cochlear damage may present as tinnitus. Early hearing loss may go unrecognized by the patient and initially manifest as an increase in the threshold of highest frequencies (>4000 Hz). With progression, lower speech frequencies are affected and the patient may become profoundly deaf if the drug is continued. If the drug is stopped early in the course of damage, further loss may be prevented, and partial recovery of auditory thresholds may be possible. However, the loss is usually permanent. Symptoms of vestibular toxicity typically include imbalance and visual symptoms. The imbalance is worse in the dark or in situations in which footing is uncertain. Spinning vertigo is unusual. The visual symptoms, called oscillopsia, occur only when the head is moving. Quick movements of the head are associated with transient visual blurring. This can cause difficulties with seeing signs while driving or recognizing people's faces while walking. Clinically, nystagmus may be present as an early sign. Prevention of aminoglycoside ototoxicity involves careful monitoring of serum drug levels and renal function as well as hearing evaluations before, during, and after therapy. Measure baseline audiometric function before therapy; however, this is not always possible in acute situations. Daily administration decreases incidence of ototoxicity and should be considered whenever possible. Conscientiously identify high-risk patients and select alternative antibiotics for them. Lastly, because aminoglycosides remain in the cochlea long after therapy has ended, instruct patients to avoid noisy environments for 6 months after therapy completion because they remain more susceptible to noise-induced cochlear damage. Streptomycin: Streptomycin was the first clinically applied aminoglycoside and was used successfully against gram-negative bacteria in the past. Streptomycin preferentially affects the vestibular system rather than the auditory system. Vestibular damage due to streptomycin is common with prolonged use and in patients with impaired renal function. Because of its toxicity, and because of widespread resistance, this agent is used infrequently today. However, streptomycin use has risen for treatment of tuberculosis. Gentamicin: As with streptomycin, gentamicin has a predilection for the vestibular system. Therapeutic peak serum levels of 10-12 mcg/mL are generally considered safe but may still be toxic in some patients. Carefully adjust dosing in patients with renal disease. Neomycin: This agent is one of the most cochleotoxic aminoglycosides when administered orally and in high doses; therefore, systemic use generally is not recommended. Neomycin is among the slowest aminoglycosides to clear from the perilymph; consequently, delayed toxicity (1-2 wk) may ensue after discontinuation of therapy. Neomycin is mainly used as an effective otic and ototopical agent. Although neomycin is generally considered safe when used topically in the ear canal or on small skin lesions, equally effective alternatives are available. Kanamycin: Although less toxic than neomycin, kanamycin is quite ototoxic. Kanamycin has a propensity to cause profound cochlear hair cell damage, marked high-frequency hearing loss, and complete deafness. 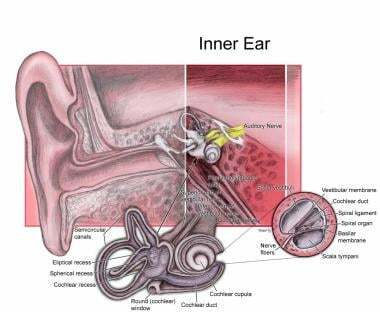 The damaging effect is primarily to the cochlea, while the vestibular system is usually spared injury. Kanamycin has limited clinical use today. As with neomycin, parenteral administration is generally not recommended. Tobramycin: Ototoxicity of tobramycin is similar to that of amikacin; high-frequency hearing loss results. As with kanamycin, vestibular toxicity is less common. Tobramycin is frequently used in otic and topical preparations. Topical use, although not without controversy, is generally considered safe. Erythromycin was introduced in 1952 and has seen widespread use in clinical medicine. Generally, erythromycin is considered a safe medication. Erythromycin has been considered the substitute of choice in group A streptococcal and pneumococcal infections for penicillin-sensitive individuals. Erythromycin remains the antibiotic of choice for Legionella pneumonia and other atypical pneumonias. The first reports of ototoxicity were not noted until 1973. Since then, only sporadic cases of ototoxicity have been reported, and they have generally been reversible. These patients tended to have other risk factors, including renal failure, hepatic failure, doses of more than 4 g/d, and intravenous administration. Clinically significant hearing loss also has been reported in recipients of renal allografts who were treated with intravenous erythromycin. Onset is generally within 3 days of starting treatment. Speech frequencies may be affected rather than higher frequencies. Effects are usually reversible. Azithromycin and clarithromycin are newer macrolide antibiotics. These antibiotics have seen widespread clinical use because they have fewer GI side effects and a broader antimicrobial spectrum than erythromycin. However, recently, some reports have appeared regarding possible ototoxic effects. Reports are currently sporadic and further investigation is needed. Vancomycin is a glycopeptide antibiotic that was introduced in the 1950s. It is a commonly used medication in light of its efficacy in methicillin-resistant staphylococcal infections. Several reports of ototoxicity, usually manifesting as tinnitus, have been presented in patients with elevated serum concentrations attributed to renal failure or in those patients receiving concomitant aminoglycoside therapy. The data are unclear but suggest that ototoxicity is reversible in at least some individuals. No studies demonstrate conclusive evidence of ototoxicity with vancomycin administration alone and in therapeutic doses. No recommendations have been made regarding its use; however, the authors suggest caution with coadministration of vancomycin and other ototoxic agents, and documentation of vancomycin serum levels. Loop diuretics exert therapeutic effects at the loop of Henle. This class of medications includes several different chemical groups, including sulfonamides, phenoxyacetic acid derivatives, and heterocyclic compounds. These drugs are used to treat congestive heart failure, renal failure, cirrhosis, and hypertension. The most effective and frequently used diuretics (eg, ethacrynic acid, furosemide, bumetanide) can cause ototoxicity. Several less-commonly used loop diuretics also have been experimentally shown to cause ototoxicity; this group includes torsemide, azosemide, ozolinone, indacrinone, and piretanide. The ototoxic effects of loop diuretics seem to be associated with the stria vascularis, which is affected by changes in the ionic gradients between the perilymph and endolymph. These changes cause edema of the epithelium of the stria vascularis. Evidence also suggests that endolymphatic potential is decreased; however, this is usually dose dependent and reversible. Ototoxicity caused by ethacrynic acid seems to develop more gradually and takes longer to resolve than that caused by furosemide or bumetanide. Overall, ototoxicity attributed to this group of medications is usually self-limited and reversible in adult patients, although irreversible hearing loss has been reported in neonates. Ototoxicity is estimated to occur in 6-7% of patients taking loop diuretics. Occurrence of loop diuretic ototoxicity depends on several factors, including dose, infusion rate, history of renal failure, and co-administration of other ototoxic agents. Depending on the particular loop diuretic, patients usually relate a history of hearing loss soon after taking the agent. Patients also may complain of tinnitus and dysequilibrium; however, these symptoms are less common and seldom occur without hearing loss. Some patients may experience permanent hearing loss, especially those with renal failure, those receiving high doses, or those receiving aminoglycoside antibiotics concurrently. Prevention of ototoxicity caused by loop diuretics consists of using the lowest doses possible to achieve desired effects and avoiding rapid infusion rates. Additionally, the risk factors associated with administration of these drugs must be diligently assessed, including co-administration of other ototoxic medications and history of renal failure. As potentiation and synergism of ototoxic effects of aminoglycosides and loop diuretics is well documented, co-prescription of these drugs is not recommended. Antineoplastic agents most commonly associated with ototoxicity are the platinum-based compounds cisplatin and, to a lesser degree, carboplatin. These agents are widely used in gynecologic, lung, central nervous system, head and neck, and testicular cancers. Antineoplastics are cell-cycle nonspecific alkylating agents that insert into the DNA helix, disrupting replication. Cisplatin is distributed widely, but the highest concentrations are found in the kidneys, liver, and prostate. Cisplatin irreversibly binds to plasma proteins and can be detected up to 6 months after completion of therapy. Carboplatin is not protein bound and is more readily cleared by the kidneys. Dose and efficacy of cisplatin and carboplatin are limited largely by adverse effects. Most notably, these agents produce nephrotoxicity and ototoxicity with increasing dose. The mechanism of platinum ototoxicity is mediated by free-radical production and cell death. Platinum compounds damage the stria vascularis in the scala media and cause outer hair cell death beginning at the basal turn of the cochlea. Free radical species are produced by NADPH oxidase in the inner hair cells following cisplatin exposure. NADPH oxidase is the enzyme that catalyses the formation of superoxide radicals. A particular form of NADPH oxidase, NOX3, is highly and selectively produced in the inner ear and is an important source of free radical generation in the cochlea, which might contribute to hearing loss. The free radicals generated by this mechanism then lead to mitochondria-mediated and caspase-mediated apoptotic cell death, and ultimately permanent hearing loss. Incidence and severity of ototoxicity depend on dose, infusion rate, and number of cycles, renal status, and co-administration of other ototoxic agents. Incidence and severity is also higher in the pediatric population and in patients receiving radiation therapy to the head and neck. Some studies describe a hearing loss of 61% of children receiving platinum-based chemotherapy. This is comparable with earlier studies. The following risk factors have been identified for development and potentiation of platinum-induced ototoxicity: (1) high dose and increasing number of cycles, (2) concurrent or past cranial irradiation, (3) age extremes, (4) dehydration, (5) co-administration of other ototoxic agents, and (6) renal failure. Patients with platinum-induced ototoxicity may report tinnitus and experience subjective hearing loss. Hearing loss associated with cisplatin toxicity is usually bilateral, sensorineural, irreversible, and progressive. High-frequency hearing is typically affected first, but loss may not appear until several days or months after the last dose. Conversely, severe hearing loss may occur after a single dose. Obtain baseline audiograms and periodic follow-up audiograms during therapy for all patients receiving these agents. Perform these studies immediately before subsequent drug cycles so the maximal effect of the previous cycle can be determined. Lastly, patients should continue to undergo audiometric testing because of significant drug retention long after completion of therapy. Also advise patients to avoid noise exposure for up to 6 months. Acetylsalicylic acid, commonly known as aspirin, is used widely for its anti-inflammatory, antipyretic, and analgesic properties. Aspirin is an inhibitor of platelet aggregation and is used to treat patients with a history of transient ischemic attacks, stroke, unstable angina, or myocardial infarction. Acetylsalicylic acid is absorbed rapidly after oral administration and is hydrolyzed in the liver to its active form, salicylic acid. Therapeutic levels range from 25-50 mcg/mL for analgesic and antipyretic effects to 150-300 mcg/mL for treatment of acute rheumatic fever. However, tinnitus can occur at serum levels as low as 200 mcg/mL. Salicylic acid quickly enters the cochlea, and perilymph levels parallel serum levels. Increasing levels produce tinnitus and, generally, a reversible flat sensorineural hearing loss. The mechanism is multifactorial but appears to cause metabolic rather than morphologic changes within the cochlea. Incidence of ototoxicity is as high as 1% and is most commonly observed in elderly patients, even at low doses. Risk factors associated with salicylate ototoxicity include high dose, elderly age, and dehydration. Tinnitus is the most common adverse effect of salicylate toxicity. Other adverse effects include hearing loss, nausea, vomiting, headache, confusion, tachycardia, and tachypnea. Hearing loss is typically mild to moderate and bilaterally symmetric. Recovery usually occurs 24-72 hours after cessation of the drug. Salicylate toxicity is treated by electrolyte monitoring and fluid administration, with the addition of alkaline diuresis, if necessary. Oxygen administration and mechanical ventilation also may be needed in severe cases. Derived from cinchona tree bark, quinine was historically used to treat malaria and for its antipyretic qualities. Use today is limited by availability of less-toxic alternatives. Quinine is occasionally used to treat nocturnal leg cramps and as an adjunct to antimalarial therapy. Quinine primarily undergoes hepatic metabolism. Quinine toxicity can produce tinnitus, hearing loss, vertigo, headache, nausea, and vision loss. Hearing loss is usually sensorineural and reversible. A characteristic sensorineural notch often is present at 4000 Hz. Irreversible hearing loss rarely has been reported with quinine use. Treatment for quinine ototoxicity mainly consists of discontinuation of therapy; amplification can be used in rare cases of irreversible hearing loss. Baseline testing should be obtained before the start of chemotherapeutic agents, especially cisplatin and carboplatin. In those patients taking aminoglycosides, baseline testing should be obtained within 72 hours of the start of treatment. Patient selection, complicating medical factors, level of consciousness, and age play a role in selecting methods for early detection. Baseline testing, when possible, should be comprehensive. At a minimum bilateral pure-tone air-conduction thresholds at standard audiometric frequencies from 0.25 to 8 kHz should be obtained. If equipment allows threshold frequencies about 8 kHz should also be measure. Additional testing would include a case history including family history, otoscopic examination, immittance or bone-conduction testing, speech reception thresholds, and word recognition scores. For patients unable to cooperate or tolerate standard testing objective testing with otoacoustic emission (OAE), EchochG, and/or auditory brainstem response (ABR) testing should be obtained for documentation and monitoring. OAE testing is specifically sensitive to the status of the outer hair cells in the cochlea and is a relatively efficient objective test to assess cochleotoxicity. EChochG is a more invasive and time-consuming transtympanic test that evaluates cochlear and neural responses. ABR is also a time-consuming test and is additionally limited to stimuli responses to frequencies between 1 and 4 kHz. Monitoring should continue during therapy at regular intervals. With any sign of ototoxicity, measures should be taken to reduce toxicity as possible. For aminoglycoside antibiotics, weekly to bi-weekly testing has been suggested. For chemotherapeutic medication, weekly testing is recommended. The interval for testing should decrease with the first sign of ototoxic change. Monitoring should continue for at least 3-6 months following cessation of the potentially ototoxic medication or until the hearing stabilizes. The definition and criteria for ototoxicity has been established by the American Speech-Language-Hearing Association (ASHA), the National Cancer Institute Common Terminology Criteria for Adverse Events (CTCAE), and by Brock. ASHA define ototoxicity as: (a) 20db or greater decrease in pure-tone threshold at one frequency, (b) 10db or greater decreased at 2 adjacent frequencies, or (c) loss of response at 3 consecutive test frequencies in which responses were previously obtained, when OAE or ABR is used. Grade 1 - Threshold shift or loss of 15-25 dB relative to baseline, averaged at two or more contiguous frequencies in at least one ear. Vestibulotoxic criteria have not been well established. Standard battery of vestibular testing, including caloric testing, VEMP, and VNG, are useful for documenting vestibulopathy. In addition, given oscillopsia as the main symptom, addition of rotational testing, especially at high frequencies, is recommended. The presence of rotational function may not be evident after caloric testing and can indicate intact responses in other areas of vestibular sensitivity that may otherwise be missed. Intact function may separate the patient who will benefit from vestibular rehabilitation from the patient who will not. The primary concern is to maintain patient communication capabilities during what is generally a serious illness. Consult an audiologist early for baseline assessment. Additionally, it is essential to counsel patients and parents regarding the risks of ototoxic medications and emphasize the importance of prompt reporting of symptoms such as tinnitus, hearing loss, oscillopsia, and dysequilibrium. High-frequency sounds provide major contributions to speech intelligibility and can therefore have significant effects on communication and listening abilities. When hearing loss occurs, referring patients appropriately for hearing amplification to prevent communication, social, and education set-backs is essential. The vestibular system is able to compensate for unilateral loss. Vestibular rehabilitation is recommended to aid an individual in facilitating compensation. In bilateral loss, rehabilitation will aid the patient in using other mechanisms to improve balance and function. Certain topical potentially ototoxic drugs that are commonly used in the ear for treatment of acute otitis media (AOM) and chronic suppurative otitis media (CSOM) have recently been evaluated and a consensus position has been presented by the AAO-HNS. The most commonly used ototopical medication is a combination of neomycin-polymyxin. Newer, available ototopical medications are of the class fluoroquinolones, including ciprofloxacin and dexamethasone (Ciprodex) and ofloxacin otic preparations. When possible, topical antibiotic preparations free of potential ototoxicity should be used in preference to ototopical preparations that have the potential for otologic injury if the middle ear or mastoid is open. (Aminoglycoside-containing topical drops are not FDA approved for use in the middle ear). If used, potentially ototoxic antibiotic preparation should be used only in infected ears. Use should be discontinued after the infection has resolved. Round window permeability contributes to ototoxic effects. Animal data suggest that the thickened, edematous middle ear mucosa present in an infected ear may provide protection from ototoxicity. If potentially ototoxic antibiotic drops are prescribed for use in the middle ear or mastoid, the patient/parent should be warned of the risk of ototoxicity. And should be instructed to call the physician should dizziness, vertigo, hearing loss, or tinnitus occur. The consensus panel did not feel routine auditory or vestibular monitoring was warranted. If the middle ear and mastoid are intact and closed, then the use of potentially ototoxic preparations present no risk of ototoxic injury. Overall, although evidence suggests that otologic injury from aminoglycoside ototopical preparations is infrequent, the evidence also suggests that they offer no advantage over nontoxic agents. Therefore, this author discourages routine use of neomycin ototopical preparations for AOE and CSOM and recommends fluoroquinolone preparations, such as ofloxacin otic drops and Ciprodex drops, especially in persons with open middle ear space or ventilation ear tubes. Over the past decade, intratympanic gentamicin has become a major treatment modality for intractable Ménière disease. Although early vestibular ablation used streptomycin, gentamicin is now the preferred preparation because it is more vestibulotoxic than cochleotoxic and therefore may ablate vestibular function while preserving hearing. The idea is that unilateral vestibular loss allows compensation from the contralateral vestibular system, allowing for improved overall function. Ganesan P, Schmiedge J, Manchaiah V, Swapna S, Dhandayutham S, Kothandaraman PP. Ototoxicity: A Challenge in Diagnosis and Treatment. J Audiol Otol. 2018 Apr. 22 (2):59-68. [Medline]. [Full Text]. Kahlmeter G, Dahlager JI. Aminoglycoside toxicity - a review of clinical studies published between 1975 and 1982. J Antimicrob Chemother. 1984 Jan. 13 Suppl A:9-22. [Medline]. Monsell EM, Cass SP, Rybak LP. Therapeutic use of aminoglycosides in Ménière's disease. Otolaryngol Clin North Am. 1993 Oct. 26(5):737-46. [Medline]. Hirvonen TP, Minor LB, Hullar TE, Carey JP. Effects of intratympanic gentamicin on vestibular afferents and hair cells in the chinchilla. J Neurophysiol. 2005 Feb. 93(2):643-55. [Medline]. Gonzalez-Garrido A, Vega R, Mercado F, Lopez IA, Soto E. Acid-Sensing Ion Channels Expression, Identity and Role in the Excitability of the Cochlear Afferent Neurons. Front Cell Neurosci. 2015. 9:483. [Medline]. [Full Text]. Hiel H, Schamel A, Erre JP, Hayashida T, Dulon D, Aran JM. Cellular and subcellular localization of tritiated gentamicin in the guinea pig cochlea following combined treatment with ethacrynic acid. Hear Res. 1992 Jan. 57(2):157-65. [Medline]. Leitner MG, Halaszovich CR, Oliver D. Aminoglycosides inhibit KCNQ4 channels in cochlear outer hair cells via depletion of phosphatidylinositol(4,5)bisphosphate. Mol Pharmacol. 2011 Jan. 79(1):51-60. [Medline]. Rybak LP, Whitworth CA. Ototoxicity: therapeutic opportunities. Drug Discov Today. 2005 Oct 1. 10(19):1313-21. [Medline]. Selimoglu E. Aminoglycoside-induced ototoxicity. Curr Pharm Des. 2007. 13(1):119-26. [Medline]. Matz GJ. Aminoglycoside cochlear ototoxicity. Otolaryngol Clin North Am. 1993 Oct. 26(5):705-12. [Medline]. Fischel-Ghodsian N. Genetic factors in aminoglycoside toxicity. Ann N Y Acad Sci. 1999 Nov 28. 884:99-109. [Medline]. Roland PS. New developments in our understanding of ototoxicity. Ear Nose Throat J. 2004 Sep. 83(9 Suppl 4):15-6; discussion 16-7. [Medline]. Rybak LP, Kelly T. Ototoxicity: bioprotective mechanisms. Curr Opin Otolaryngol Head Neck Surg. 2003 Oct. 11(5):328-33. [Medline]. Kocyigit I, Vural A, Unal A, et al. Preventing amikacin related ototoxicity with N-acetylcysteine in patients undergoing peritoneal dialysis. Eur Arch Otorhinolaryngol. 2014 Jul 30. [Medline]. Kranzer K, Elamin WF, Cox H, Seddon JA, Ford N, Drobniewski F. A systematic review and meta-analysis of the efficacy and safety of N-acetylcysteine in preventing aminoglycoside-induced ototoxicity: implications for the treatment of multidrug-resistant TB. Thorax. 2015 Nov. 70 (11):1070-7. [Medline]. Vasconcelos KA, Frota SMMC, Ruffino-Netto A, Kritski AL. Sequential analysis as a tool for detection of amikacin ototoxicity in the treatment of multidrug-resistant tuberculosis. J Bras Pneumol. 2018 Apr. 44 (2):85-92. [Medline]. [Full Text]. Uzun C, Koten M, Adali MK, et al. Reversible ototoxic effect of azithromycin and clarithromycin on transiently evoked otoacoustic emissions in guinea pigs. J Laryngol Otol. 2001 Aug. 115(8):622-8. [Medline]. Levine DP. Vancomycin: a history. Clin Infect Dis. 2006 Jan 1. 42 Suppl 1:S5-12. [Medline]. Knight KR, Kraemer DF, Neuwelt EA. Ototoxicity in children receiving platinum chemotherapy: underestimating a commonly occurring toxicity that may influence academic and social development. J Clin Oncol. 2005 Dec 1. 23(34):8588-96. [Medline]. Waissbluth S, Del Valle A, Chuang A, Becker A. Incidence and associated risk factors for platinum-induced ototoxicity in pediatric patients. Int J Pediatr Otorhinolaryngol. 2018 Aug. 111:174-9. [Medline]. Waissbluth S, Chuang A, Del Valle A, Cordova M. Long term platinum-induced ototoxicity in pediatric patients. Int J Pediatr Otorhinolaryngol. 2018 Apr. 107:75-9. [Medline]. Jung TT, Rhee CK, Lee CS, et al. Ototoxicity of salicylate, nonsteroidal antiinflammatory drugs, and quinine. Otolaryngol Clin North Am. 1993 Oct. 26(5):791-810. [Medline]. Bhansali SA, Stockwell CW, Bojrab DI. Oscillopsia in patients with loss of vestibular function. Otolaryngol Head Neck Surg. 1993 Jul. 109(1):120-5. [Medline]. MacDougall HG, Weber KP, McGarvie LA, Halmagyi GM, Curthoys IS. The video head impulse test: diagnostic accuracy in peripheral vestibulopathy. Neurology. 2009 Oct 6. 73(14):1134-41. [Medline]. Jonathan B Clark, MD, MPH. Evaluation of Visual Vestibular Interaction With the Dynamic Visual Acuity Test. micromedical.com. Available at http://www.micromedical.com/Newsletter/MMNewsletter20.pdf. Accessed: 4/25/2010. Ishiyama G, Ishiyama A, Kerber K, Baloh RW. Gentamicin ototoxicity: clinical features and the effect on the human vestibulo-ocular reflex. Acta Otolaryngol. 2006 Oct. 126(10):1057-61. [Medline]. Lai P, Coulson C, Pothier DD, Rutka J. Chlorhexidine ototoxicity in ear surgery, part 1: review of the literature. J Otolaryngol Head Neck Surg. 2011 Dec. 40(6):437-40. [Medline]. Kaplan DM, Hehar SS, Bance ML, et al. Intentional ablation of vestibular function using commercially available topical gentamicin-betamethasone eardrops in patients with Meniere's disease: further evidence for topical eardrop ototoxicity. Laryngoscope. 2002 Apr. 112(4):689-95. [Medline]. Cohen-Kerem R, Kisilevsky V, Einarson TR, et al. Intratympanic gentamicin for Menière's disease: a meta-analysis. Laryngoscope. 2004 Dec. 114(12):2085-91. [Medline].